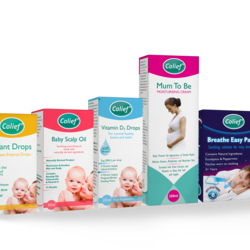 • Colief® Infant Drops is a natural product which is added to infant milk and used to treat temporary lactose intolerance in babies suffering from colic. • The drops can be used at every feed from birth until the baby is around three to four months old. - Colief Vitamin D Drops: a food supplement which helps with normal development of healthy bones and teeth. - Colief Baby Scalp oil: is a natural product that relieves the symptoms of cradle cap and flaky scalps. Suitable for infants from two months upwards. Colief Mum and Baby: is a rich blend of plant oils and essential vitamins developed especially to nourish and care for skin during pregnancy and later supports the body as it recovers.